Listen to the she-explores.com podcast by Gale Straub as she interviews our Executive Director, Agnes Vianzon. 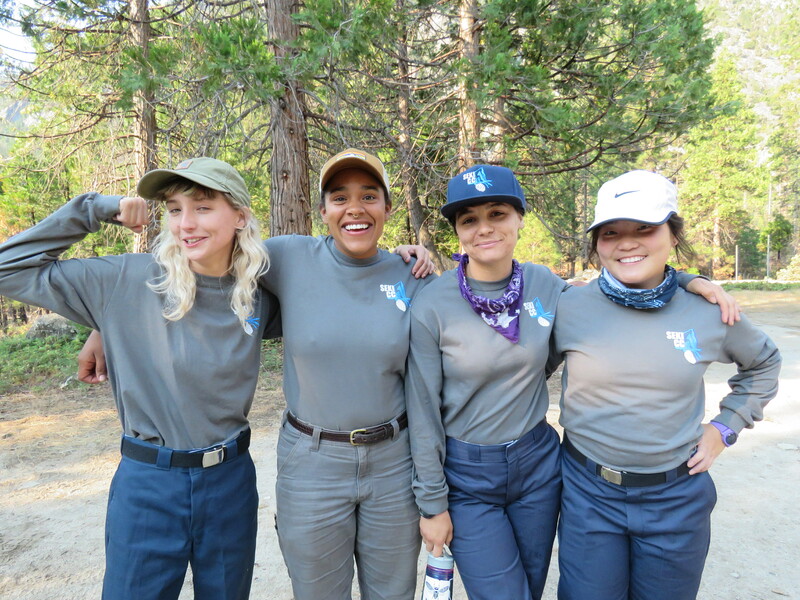 Eastern Sierra Conservation Corps is a development and leadership program committed to building a stronger and more inclusive community. We provide opportunities for youth and young adults to experience and better understand wilderness and natural resources by providing a transformational backcountry experience. ESCC focuses recruitment from priority populations. By way of hard work, new environments, education, and guidance on an intimate group level, our members are given a role in creating new life experiences. Through work in the wilderness, our members undergo an experience like no other — breaking boundaries, learning about themselves and others, and forming a deep appreciation of the outdoors. Through individual service learning we are engaging youth in protecting their remaining wild lands. We provide our members opportunities to learn about conservation education, sustainability issues, citizen science, natural history, botany, geology, archaeology, wilderness ethics, Leave No Trace principles, backpacking, trail stewardship, and so much more. Through community based events that foster good relations, and providing access and nature contact, we also hope to engage the public in community based environmental education and environmental protection. Although ESCC will have a seasonal focus, some community events and member service may occur year-round. Our board, officers, staff, and leaders have a diverse range of experiences and qualifications including technical expertise in trail building and wilderness management, leadership in youth development programs, managerial and business foundations, and a strong commitment to environmental stewardship. We employ a systems based evidentiary approach of best field practices taken from other successful and thriving youth conservation corps as well as experience in partnership with federal and state land management agencies including the National Park Service, the US Forest Service, CA State Parks and other state and federal agencies. ESCC provides opportunities for youth and young adults from populations that have traditionally been underrepresented in our National Parks and Forests. We will facilitate a nature connection and experience that fosters a better understanding of wilderness natural resources, and provide a pathway for obtaining a high school diploma and/or community college coursework. In addition to this goal of furthering traditional education, our participants will experience transformative learning within the program through outdoor education. The first, and often most powerful experience comes from stepping out entirely into the outdoors. We place our crew members outside of the inner city, bounds of social and economic hierarchy, and social settings that distract from the core human tenants of life. Beyond a new set of “hard” skills, we teach our crew members that survival depends upon smart decision making and good judgment, stems from resourcefulness, and shares equally in self-reliance and partnership with those around you. A task at hand, a unified plan, the sharing of daily life duties, and the removal of technological influence builds a community where our members learn that success comes from honoring a shared goal and commitment and starts with accountability and honesty. In addition to our member focus, community education and outreach activities aim to partner with the local public to foster an understanding of evidentiary based best land management practices and facilitate environmental stewardship opportunities. From building a trail to building a community, our partnerships are built on transparency and forward-thinking efficiency.